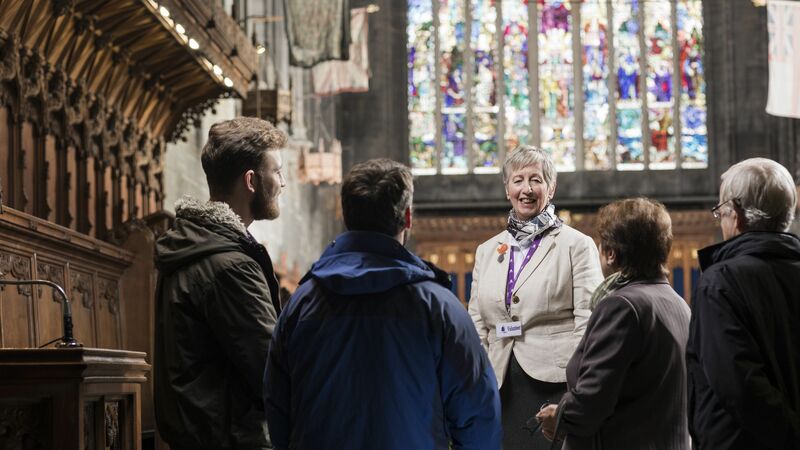 This weekend will see women gather in four major cities throughout the UK to take part in the Processions event – a mass participation artwork to celebrate one hundred years of votes for women. On Sunday 10 of June, women and girls in Edinburgh, Belfast, Cardiff and London will walk together wearing green, white or violet – the colours of the suffragette movement – for the national event. 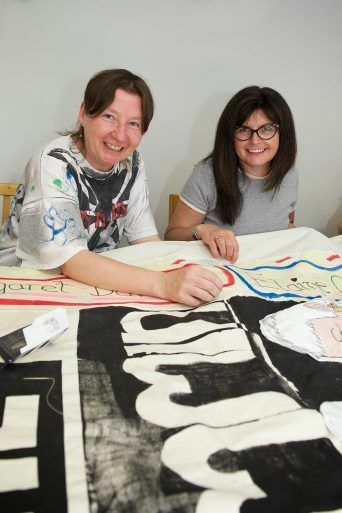 One hundred female artists across the UK were commissioned to work with organisations and communities to create one hundred centenary banners for Processions as part of an extensive public programme of creative workshops. One of the artists selected for the project was Mandy Mcintosh – artist in residence at the Tannahill Centre in Ferguslie Park, Paisley. Paisley.is had a chat with Mandy to find out more about her work with women’s groups at the Tannahill Centre ahead of Processions. “I had been working with groups in the Tannahill Centre in Ferguslie Park throughout the bidding process for UK City of Culture 2021 and Processions was announced Jean Cameron nominated me as one of the 100 UK artists in residence. “As part of the project I worked with women from the Feegie Needlers and Strong Women in Ferguslie Together (SWIFT) groups not just on the practical side of the project which included passing on skills around working with textiles, screen printing, sewing and lino cutting, but also encouraged dialogue and discussion around women’s empowerment. “It was important to me to ensure that the women participating in the project were able to decide what they wanted to say and what the focus of their banner should be. The women in the group decided that they wanted to honour women from their community who had made a positive impact on the lives of others living in Ferguslie Park. 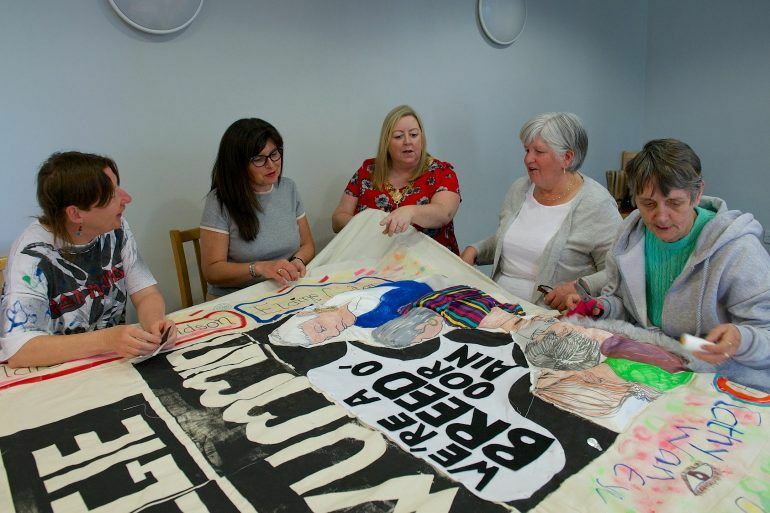 “After a vote on the Facebook page ‘Feegie Memories’ it was decided that five strong Ferguslie Women would be represented on the banner for their work as community activists. The local women celebrated are: Maggie McCulloch, Sadie Boyle, Elaine Carter, Hilda Cameron and Josie Roy who passed away recently. All these women made a difference to the community of Ferguslie Park. “Our banner features a snapshot of women in conversation – intergenerational women sharing their knowledge and history. 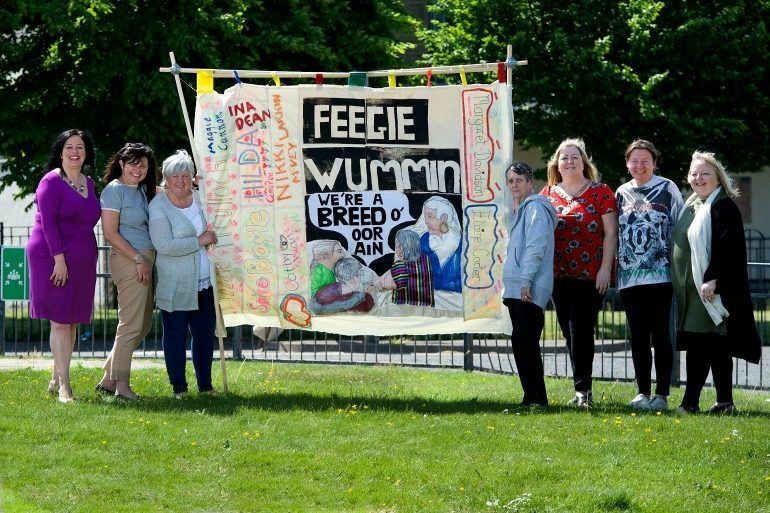 Our banner carries the slogan “Feegie Wummin – We’re a breed o’ oor ain” which came about after one of the group members, Claire O’Neill said it during a workshop session and it seemed like the perfect way to capture the women of the community – it demonstrates the resilience of the women of Ferguslie Park and their ability to overcome challenges. 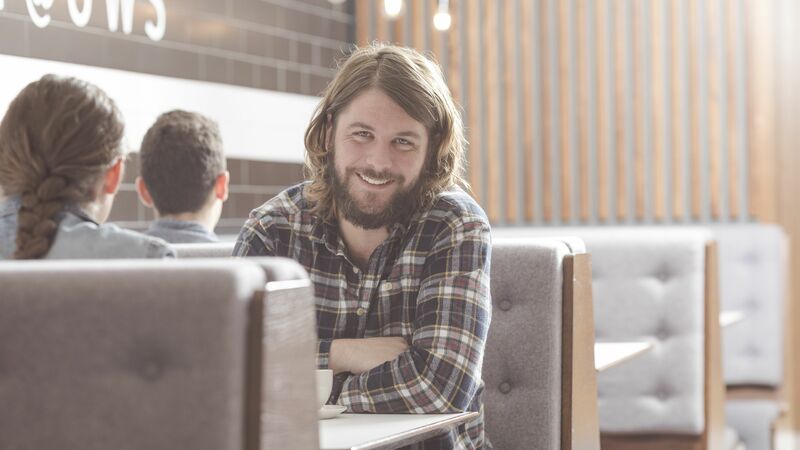 “It’s been a fantastic project to be part of. Ferguslie Park is a unique community and it’s really impacted on me working with these women – I’ve been really inspired by them. The women have really opened up and talked about their own experiences – it’s a really supportive and inclusive environment that makes people feel welcome. Members of the group will head to Edinburgh on Sunday to carry their banner through the streets of the capital. To find out more about Processions please visit: www.processions.co.uk.